The Textile District custom prints fabric by the yard for apparel, home decor, upholstery, quilting and crafts! Our fabric swatch kit and color library are handy tools to help guide you along the way. 15+ Options - Upholstery, Apparel, Home Decor, and More! See and feel the quality and texture of our ground fabrics! 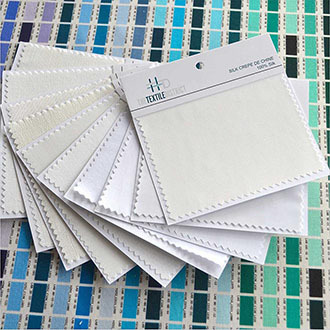 Each ground fabric swatch kit includes a 5" x 5" unprinted (white) sample of the ground fabrics we offer: Silk Cotton Voile, Silk Crepe de Chine, Cotton Silk, Cotton Pima Lawn, Cotton Quilting, Cotton Sheeting, Polyester Micro Fiber/Spandex 4-way Stretch, Polyester Scuba Deluxe with Advanced Moisture and Wicking Technology, Cotton Sateen, Belgian Linen/Cotton, Cotton Duck, Poly Linen, Cotton Sailcloth, Cotton Velvet, and Polyester Indoor/Outdoor fabric (500+ hours UV lightfastness). Contact Us for Special Orders. Choosing color can be one of the more challenging aspects of any project. Light reflects differently on surfaces and affects the perception of color. 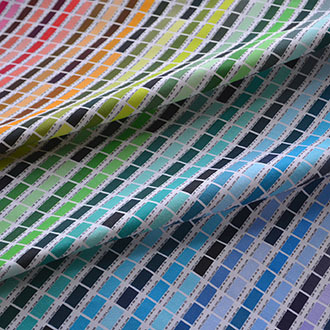 To help guide color decisions, The Textile District's Color Library features printed samples of every color in our palette, and can be printed on any of our base fabrics, from smooth fabrics like Cotton Silk, Silk Crepe de Chine and Cotton Pima Lawn or Sateen to more textured fabrics like Belgian Linen, Cotton Duck and Cotton Velvet. Price adjusts based on the ground fabric you choose.